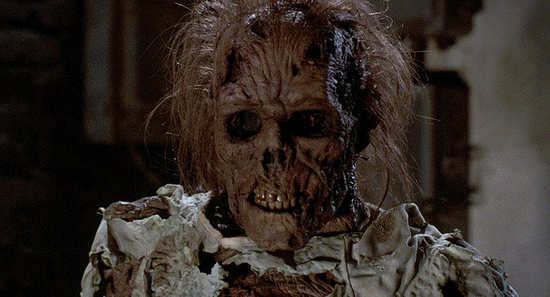 ‘Night of the Creeps’ is a lot of fun. It’s one of those gooey eighties zombie pictures that never takes itself seriously but, whilst never quite lifting off above ‘average’, delivers on its promise. In the late 1950s, the era of flying saucer mania, a cannister falls to earth, in a trail of smoke and fire. In the meantime, a young man takes his date to a parking spot where they see what looks like a falling star. When they investigate, by evil coincidence, it turns out that it has landed close to the vicinity of an escaped psychopath who attacks the girl who is alone in the car with an axe, decapitating her. The young man doesn’t fare much better. When he finds the cannister, a bunch of ‘slugs’ erupt from it and one lands in his mouth. 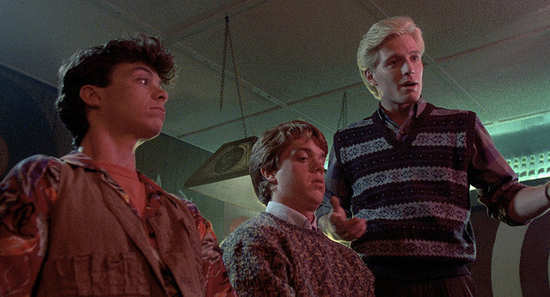 Roll forward to present time (well, 1986), to a scene with two outsider students: J.C, played by Steve Marshall, who is ‘disabled’ and his slightly geeky best friend, Chris played by Jason Lively, best known perhaps for playing Rusty Griswold in National Lampoon's European Vacation a year earlier). Chris is desperate to catch the attention of a popular female student, Cynthia (Jill Whitlow). 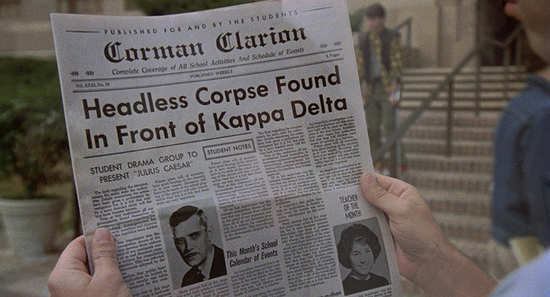 To get on her radar, they try to join one of the more popular male fraternities and agree to a pledge to find a dead body and to leave it outside of a rival fraternity house; not quite so crazy when you consider that there is a medical school on campus positively brimming with cadavers. However, when the boys snoop around the premises, they happen upon a frozen corpse in a close guarded room – the young man from all those years ago, kept in suspended animation through the miracle of cryogenics. Hitting the wrong button on the console, the corpse seems to awaken and in a semi-zombie state, tries to grab them. 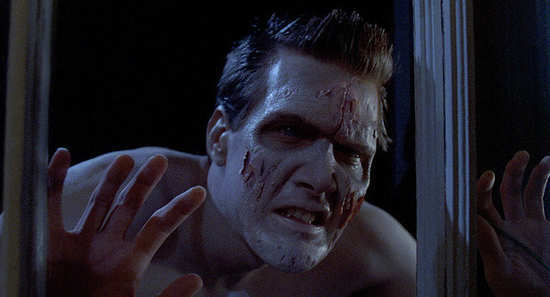 They make their escape but the zombie kills a medical student working in the lab. 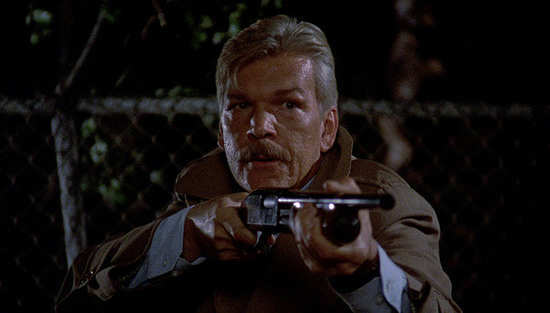 Cue hard-boiled Detective Ray Cameron (Tom Atkins – The Fog) a haunted cop in his twilight years, still scarred by being the first on the grisly scene all those years ago; effectively the person who discovered the alien experiment in the first place. The living corpse in the meantime, is making its way through the college towards the building where he had picked up his date all those years ago. Once there, his head explodes, unleashing a torrent of alien slugs. The police soon catch up with Chris and J.C. who a janitor saw running from the lab the previous evening, ‘screaming like banshees’. They confess to being there but deny moving the cadaver. Things soon start to crank up at a pace and when J.C. discreetly leaves Chris to consoleCynthia after her despicable boyfriend picks a fight with the two boys, including disabled J.C. She never wants to see her old boyfriend again – luckily for Chris! In the meantime, things get pretty sluggish for JC who becomes a bit zombified. Detective Cameron is soon on the scene and, hearing Chris’s story, and revealing that the female axe-victim from all those years ago was an ex-girlfriend, he blows the zombie corpses head off his shoulders, unleashing yet more ‘slugs’. The next night, while everyone is getting ready for a college dance, Chris finds a recorded message that J.C. left for him. J.C. says that the slugs have incubated in his brain, but he has discovered that they are susceptible to heat. 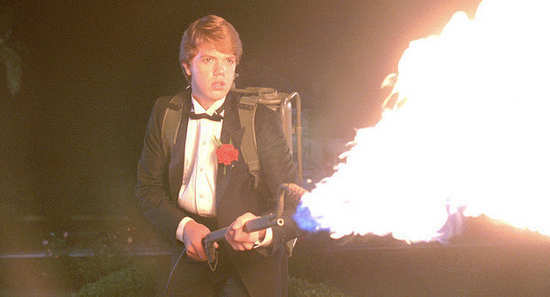 Chris tells Detective Cameron, and they retrieve a flamethrower from the police armory. They arrive at the sorority house just as Cynthia breaks up with Brad, who has become possessed. After killing him, the Beta fraternity brothers show up, despite having been killed in a bus crash. Cynthia and Chris team up to destroy the outside zombies, and Detective Cameron clears the house. After they stop the horde, Chris spots more slugs racing toward the basement; Cynthia explains that a member of the sorority had received specimen brains for biology class. In the basement, they find an enormous pile of slugs, and Detective Cameron, tape across his mouth, prepping a can of gasoline. Detective Cameron begins counting down as he splashes gasoline and Chris counts down in sync with him as he and Cynthia race out of the house. As Cameron opens up house's gas valve, several slugs leap to attack him. He flicks his lighter and the house goes up in a fiery explosion. Chris and Cynthia share a kiss as they watch the house burn. The movie ends when the dog who caused the bus accident returns and approaches Cynthia. I won’t spoil the film entirely by letting you know what happened next but you can probably guess. It’s no huge surprise that this film was penned and directed by Fred Dekker, who also made teen horror, ‘The Monster Squad’, another fun, light-weight mid 80’s horror comedy. The 1.85:1-framed transfer from Eureka is really excellent, every bit as good as a similar Arrow style release, which this very much feels like. 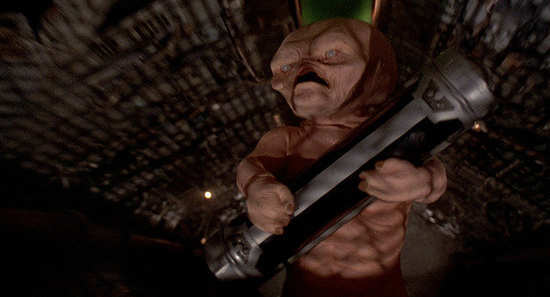 Make up and special effects are pure 1980s but pretty impressive overall – far more fun than the heavily CGI infused films we often endure today. The soundtrack (DTS-HD MA 5.1 lossless) is pretty good too with some care taken to separate some of the audio effects by channel as well as a great rendition of a classic 80's score – plenty of analogue synths here for fans of the era. Bonus features abound with no less than two audio commentaries; the first with writer/director Fred Dekker along with Michael Felsher of Red Shirt Pictures. It’s a fun and informative ride with tons of anecdotal insight. The second features the main cast with Jill Whitlow, Tom Atkins, Jason Lively and members Steve Marshall having a fun time recollecting making the film and having a few laughs along the way. If you want to see the cast and crew, rather than just hear them, an hour-long featurette, ‘Thrill Me: Making Night of the Creeps’ is also included. It’s a documentary put together for a 2009 DVD release of the film so is now a decade old but still fun and insightful nonetheless. Broken into five key chapters, it’s a pretty thorough review of how the film came into being, how it was financed and produced with tons of anecdotes from cast and crew on the making of the film, it’s initial critical reception and its place in horror movie history. Another welcome bonus featurette is ‘Tom Atkins: Man of Action’, an interview based feature, again from 2009, with Atkins talking about his many film appearances including The Fog, Escape from New York, Creepshow, Lethal Weapon and Night of the Creeps – with the emphasis on the latter. Other features include a video interview with Fred Dekker, deleted scenes, the original theatrical ending (an alternative to the director’s cut version on this disc), some ‘trivia track’ subtitles which are fun for a second viewing of the film, and the original theatrical trailer. 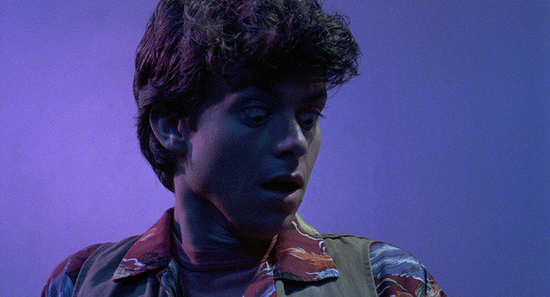 ‘Night of the Creeps’ may not be the greatest film ever made, or even close to it, but it’s certainly fun. This edition is certainly worth adding to the collection.